I was browsing the Major League Gaming Canada website today and found a gem of a video featuring Toronto Raptors All-Star, Chris Bosh. The video also features picture-in-picture commentary from Bosh's good pal Hackman Hadi a.k.a. 'Hot Boy'. Around the 6:30 mark Bosh gets into his love for video games, including his current favourites - Grand Theft Auto IV & Halo 3. For those people who have been checking out NextGen Player since our inception back in April, you may recall me mentioning Best Buy Canada giving away 5 limited edition Grand Theft Auto IV Xbox 360's during the game's midnight madness launch. Well - guess who else got one! 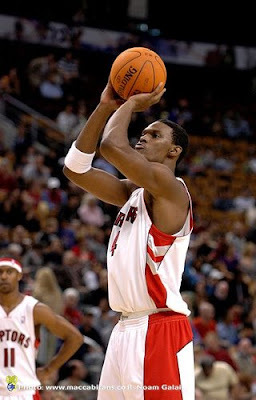 Yep, Hot Boy's best bud - Chris Bosh. "Speaking of GTA IV, first off let me say thank you to Microsoft for the Grand Theft Auto IV Special Edition Xbox. I use it every day - it's the best." "Well, I mean umm, it's pretty much, it's an Xbox 360 elite, it's pretty cool. Umm, pretty much they put a scan of something, I don't know what they did, but envision, uhh if you know what the cover looks like, place the cover on top of an Xbox. And that's kinda what is looks like, you know what I'm saying?" "Yeah, and and umm you know, it's a funny story about that is, you know sometimes, most the times I play - but I don't chat. Like I play, I don't chat. Umm because, uhh everybody can't, everybody's not mature for that." You hear that Xbox Live users - it's time to grow up!